The castle of Monsalvat and the magic castle of Klingsor in medieval Spain. ACT I. Medieval Spain. In a forest near the castle of Monsalvat, Gurnemanz, knight of the Holy Grail, rises with two young Esquires from sleep. Two other Knights arrive to prepare a morning bath for their ailing leader, Amfortas, who suffers from an incurable wound. Kundry, an ageless woman of many guises, rushes in wildly with balsam for Amfortas. The king and his entourage enter, accept the gift and proceed to the nearby lake. As Gurnemanz bewails Amfortas' wound, his companions ask him to tell about the sorcerer Klingsor, who once tried to join the knightly brotherhood. Denied because of his worldly lust, he tried to gain acceptance by castrating himself and again was rejected. Now an implacable foe, Klingsor entrapped Amfortas with a beautiful woman: while the king was lying in her arms, Klingsor snatched from him the holy spear (which had pierced Christ's side) and stabbed Amfortas. The wound can be healed only by an innocent youth made wise through compassion. Suddenly a swan falls to the ground, struck by an arrow. The Knights drag in a youth, Parsifal, whom Gurnemanz rebukes for shooting the bird. The young man flings away his bow and arrows in shame. Kundry relates that his father, Gamuret, died in battle; his mother, Herzeleide, reared the boy in the forest, but now she too is dead. As the Knights carry Amfortas' litter back, Gurnemanz leads Parsifal to the castle, wondering if he may be the prophecy's fulfillment. In the lofty Hall of the Grail, Amfortas and his Knights prepare to commemorate the Last Supper. The voice of the leader's father, the aged Titurel, bids him uncover the holy vessel, but Amfortas hesitates, his anguish rising in the presence of the blood of Christ. At length Titurel orders the Esquires to uncover the chalice, which casts a glow about the hall. As bread and wine are offered, an invisible choir is heard from above. Parsifal understands nothing, though he clutches his heart when Amfortas cries out in pain. Gurnemanz angrily drives the uncomprehending youth away. ACT II. Klingsor summons his thrall Kundry to seduce Parsifal. 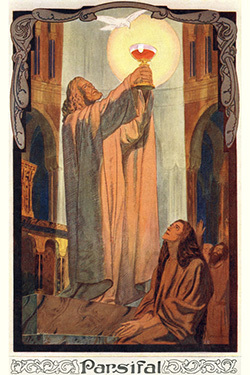 Having secured Amfortas' spear, he now seeks to inherit the Grail by destroying Parsifal, whom he recognizes as the order's salvation. Kundry, hoping for redemption, protests in vain. In Klingsor's magic garden, Flowermaidens beg for Parsifal's embrace but disappear when Kundry, transformed into a siren, enters to woo him with tender memories of his childhood and mother. As she offers a passionate kiss, the youth recoils, understanding at last the mystery of Amfortas' wound and his own mission. Kundry now tries to lure him through pity for the weary life she has been forced to lead ever since she laughed at Christ on the cross, but again she is repulsed. Cursing Parsifal to wander hopelessly in search of Monsalvat, she calls on Klingsor, who hurls the holy spear. The youth catches it and makes the sign of the cross, causing the castle to vanish. ACT III. Gurnemanz, now an old hermit, finds the penitent Kundry exhausted in a thicket. As he revives her, a knight in armor approaches. Gurnemanz recognizes Parsifal and the spear. The knight describes years of trying to find his way back to Amfortas and the Grail. Gurnemanz removes Parsifal's armor. Kundry washes his feet, drying them with her hair. In return, he baptizes her, then exclaims at the beauty of the spring fields. Distant bells announce the funeral of Titurel. They walk toward the castle. The Communion table has vanished from the Hall of the Grail. No longer able to uncover the chalice, Amfortas begs the Knights to end his anguish with death, but Parsifal touches him with the spear, which heals the wound. Raising the chalice, he accepts the homage of the Knights as their new leader. Kundry, released at last from her curse of wandering, falls dying.